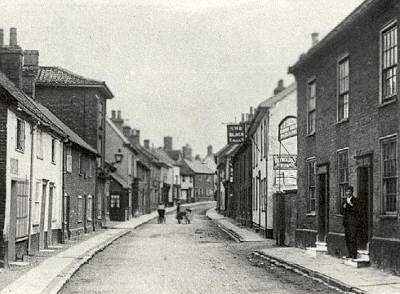 Beer has long been the drink of the working man and the residents of Halesworth have always enjoyed a good supply of the amber nectar. 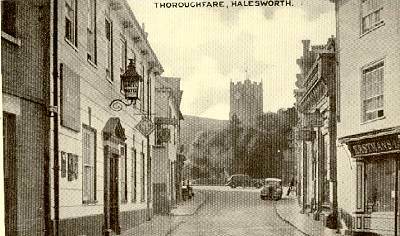 In the 17th Century Halesworth was one of the fastest growing towns in East Anglia. Between 1603 and 1674 its population doubled. In 1620 there were six inns and taverns in Halesworth, including the Angel, Lyon, Kings Arms and White Hart and two common brewers George Meeke and Thomas Thurston. Many families however were still brewing beer for their own use. In 1638 Francis Rushmere a widow left her son ...a pair of mill stones, one brewing tub, three shallow tubs, four beer vessels, a half a barrel and a copper cauldron’. It was the duty of the ‘ale founders and tasters’ to test the beer sold at the various establishments and to see that the correct measure was given. In 1651 Nathaniel Chilston and Walter Winston were chosen as ale founders and tasters in Halesworth. They were provided with ‘ One Winchester quart and one pint of pewter, as set of weights ranging from half quarter of an ounce to eight pounds, a book of directions for officers, one brand to mark the measure and a pair of brass scales.’ (ref. Manor of Halesworth Minute Book 1698). Stories abound of there having been 35 or so pubs in Halesworth. Unfortunately, for some, there have never been 35 at one time. It appears that names were changed according to the religious or political climate of the time or as a mark of respect for an influential person. The location of some of the pubs has not been found. Three pubs remain in The Angel, The White Hart and The Swan in Halesworth and The Triple Plea at The Broadway. The current Angel Hotel retains an atmosphere of an old hostelry but, at the same time, serves the needs of the visitor in the 21st Century.